We made it back from sunny Mexico late Saturday and now we are trying to get back in the swing of things, hehe! We had wonderful weather and amazing friends to hang out all week with. We definitely want to go back again sometime...for sure! My Creative Time. Again, playing with some paints, sprays and embossing enamels. I just love the texture and depth it gives to your project. My base and base layer are created with the Nesting Eyelet Square die.The next layer is a panel using papers from MME~On the bright side collection which is distressed and adhered down. The next layer is embossed with the Swirly Vines folder and then sprayed with Peach Delight glimmer mist. After drying, I then layered the leaf sprays which are created with the Poppy Stamps Lovely Tendril die. 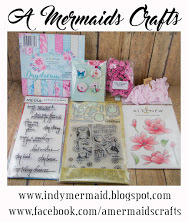 I embossed them in pearl embossing powder. The doily is My Creative Time's~Bunch of Stitched Doily dies sprayed with glimmer mist. 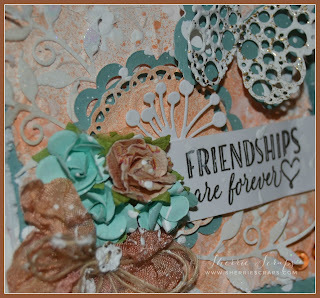 I stamped the sentiment with Friendships Are Forever stamp set onto a label I fussy cut out, then adhering in place. 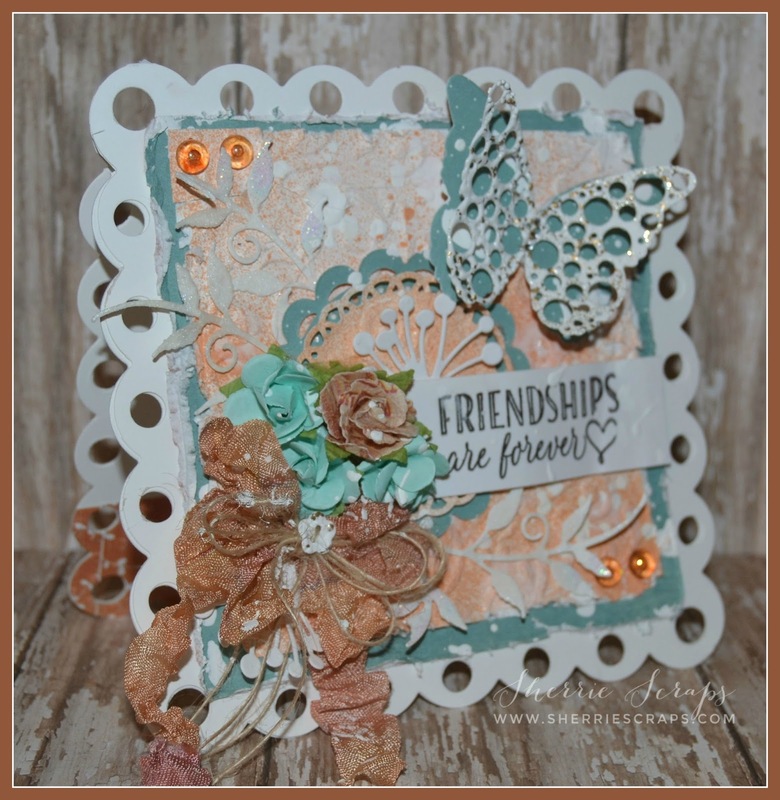 The pretty butterfly is Poppy Stamps Murana and Samirah Butterfly dies, all from Scrapy Land. The top layer is embossed with Shabby White embossing enamel and gems were added to the center. I added a pretty cluster of flowers that are from Recollections. I tucked beneath the flowers a Chandra Stem from Memory Box. I finished with skittle embellishments from DoubleClick and a pretty bow using Turning Leaf ribbon from DL.ART. The jute string is from My Craft Spot and the little button is the Wee Petite Buttons from Die Versions . Oh wow, Sherrie, this is absolutely stunning!! The texture is amazing!! I love the colors and the elements you added!! That butterfly is beautiful!! This is spectacular my friend!! I love seeing your mixed media designs!! Gorgeous, gorgeous, gorgeous!! Thank you so much for playing along at Scrapy Land and DL.ART!! This is the kind of card that I have to study for about 15 minutes to see how all the elements come together! Just gorgeous! Sherrie, this is absolutely gorgeous! I love the color palette and abundance of textures! :o) The butterfly is one of my favorite parts.. I'm so in love with Frantage. Your background cam together so beautifully and the sweet bows warm my heart. Stunning work! And I'm glad you had a wonderful vacation. :o) Have a sweet and sparkly day, my friend! Welcome back!! Your card is beautiful! What a lovely base and I just LOVE the colour scheme you've used. Your friend will be absolutely delighted with this card! So glad you had a great holiday! 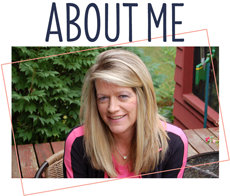 Thanks for spending time visiting my blog today. It means a lot to me! 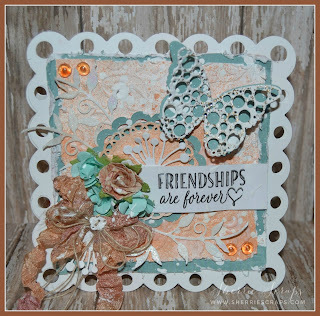 This is a gorgeous card Sherrie!! I love how you weaved in all the different elements - great job :-) Thanks for linking up with Craftin Desert Divas "Lots of Layers" linky party!! So glad to hear you enjoyed your vacation!! Your card is just beautiful, love all the layers and texture. Welcome back home! Glad to hear that you had a great time with your friends and glad that the weather held up for you. Wow, this card is gorgeous! I love all that texture and Love the colors together... just gorgeous and that butterfly is soooooo pretty! SWWOON! Yay for vacation time! It sounds like a wonderful get away...I really need one of those! This card is just amazing! The colors,textures and details are just gorgeous! So glad you had a great vacay!!!!!! Your card is gorgeous! LOVING the colors, the flowers and the butterfly!!!!!!!!!!!!!! Glad ya'll had a great time on your vacation!!! 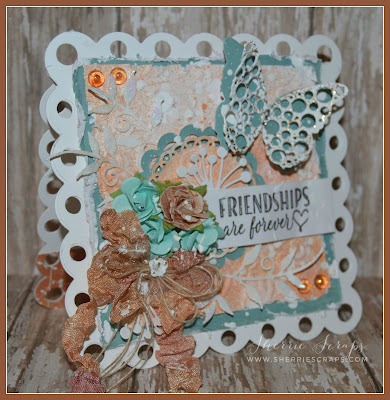 Your card is absolutely gorgeous with so many amazing embellishments! Love the pretty flowers and butterfly! Hope you had a wonderful vacation! It sounds like you had a wonderful time in Mexico! Your project is so pretty with lovely layering! Thank you so much for sharing your art with us at the Frilly and Funkie Challenge! Gorgeous card, such wonderful details and pretty colours. Happy to hear that you are back and that you had a fun time!! I love the fun texture,pretty spring colors and the gorgeous bow of course. Awesome job on the layers. I absolutely love the beautiful butterfly!! This card is BEAUTIFUL, Sherrie!! Love the pretty butterfly!! Have a great day. Love the colors on your gorgeous card! The butterfly and the ribbon are so pretty! 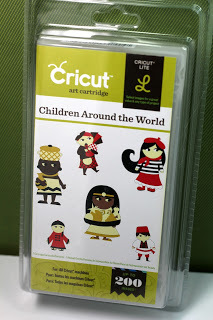 Thanks for playing along with us at DL.ART March Linky Challenge! Sherrie ~ OH MY WORD! This is STUNNING and GORGEOUS!!! WOW!! So elegant looking! Beautiful details and colors! Gorgeous card Sherrie! Love all the layers and the fancy bow and butterfly! Stunning! Beautiful card! 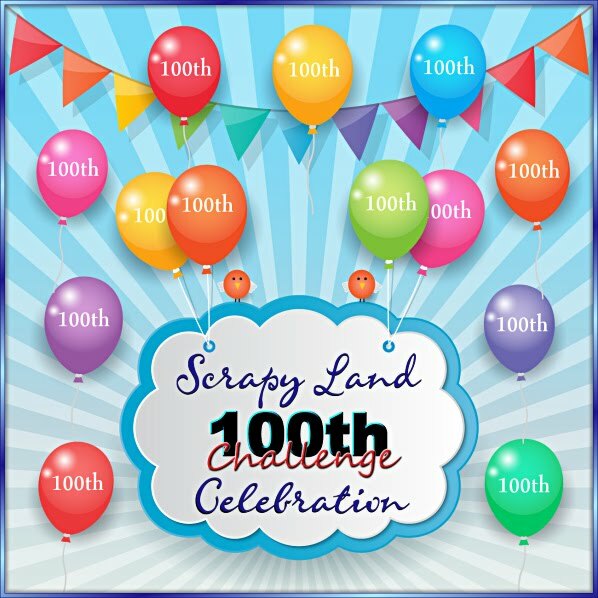 Thank you for playing along with us at Scrapy Land Challenge! 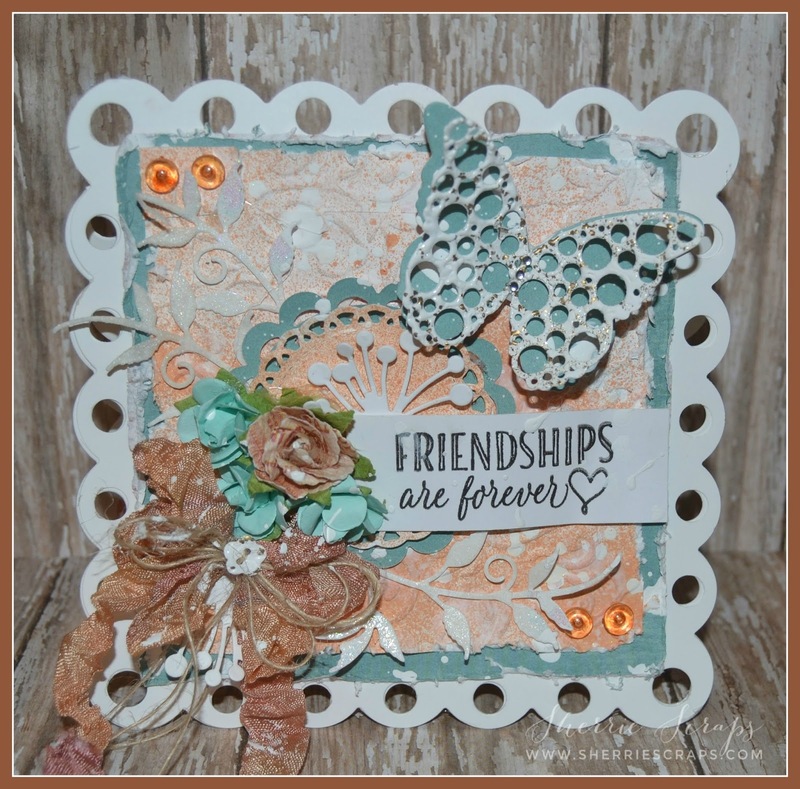 Oh what a pretty card, I just love that texture on the butterfly and the colors are so soft and pretty! I'm sure your friend will treasure it! Welcome Home :) I'm so happy to hear you had a nice time! It sounds like you had some fun :) I can't wait for our trip, I hope we have the nice weather you had and calm seas :) I know how hard it is to get back to normal, I have such a hard time with it. One stunning card Sherrie. Love the colors and the textures. The butterfly and ribbon is the perfect touch. So happy you are home and look forward to seeing some awesome creations. OH SO LUCKY to have you!